The Art Of... Photography | The Art Of | Kids VT - small people, big ideas! 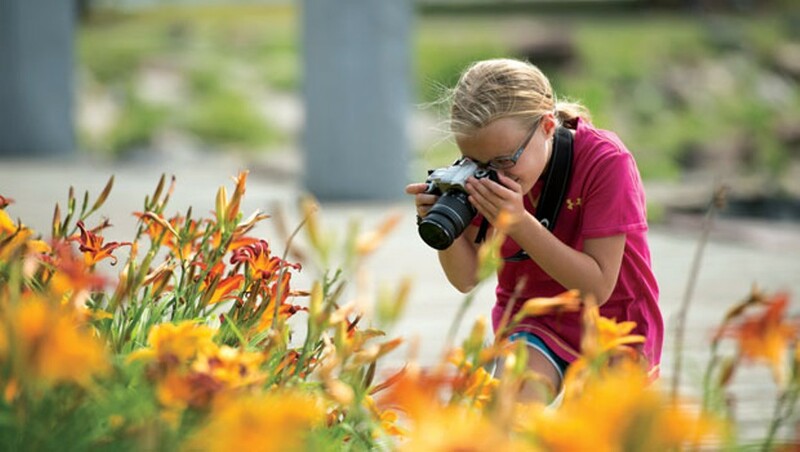 If you sign up for a photography camp at Burlington City Arts, cameras and supplies are provided. But those looking to buy their own equipment can find it at Le Zot in Burlington, South Burlington's PhotoGarden or Green Mountain Camera in Waterbury. The stores sell a variety of cameras — including basic point-and-shoot digital cameras starting at about $100 — as well as camera bags, batteries, frames, and photo printing and developing services. .In addition to its summer sessions, Burlington City Arts holds camp in darkroom and digital photography during the February vacation week. Info, 865-7166, burlingtoncityarts.org. In this digital age, photography is more accessible than ever. The ubiquity of smartphones, tablets and digital cameras makes it almost too easy for kids to take pics of their friends, pets and toys. But what if kids want to take their skills to the next level? "Photography is more about looking than capturing," says Michelle Saffran, who teaches young shutterbugs through Burlington City Arts. "When you learn how to look for something to photograph, you develop intention and you transition out of simply taking snapshots." On the first day of a BCA children's photography camp, Saffran takes kids ages 9 through 11 on a Church Street scavenger hunt to photograph everyday things: a dog, a red door, the letter C, a smile. The activity helps kids learn how to plan what they want to shoot, notes Saffran. "The kids have been on Church Street a million times, but now they're interacting with the area in a completely different way," she says. Don't always take photos at eye level. Instead, try different angles from above and below the subject. Use natural surroundings — trees, for example — to frame your subject, adding more balance and depth to a photograph. Don't be afraid to get close. A common mistake is being too far from the subject. Hold your camera steady to avoid unintentional blurring. Always ask someone before you take their photo. Even if you're photographing a dog, ask the dog's owner for permission. It's never too early to pique kids' interest in photography. Jordan Silverman, a Burlington-based professional photographer — who sometimes shoots photos for Kids VT — lets his sons, Noah, 5, and Aden, 2, play with a basic point-and-shoot camera. "Having a clunker point-and-shoot is priceless, and I don't have to worry about my sons breaking it," Silverman says. "One thing that's helped is bringing the boys' camera everywhere we go — hiking, sledding, to the lake. And we always have extra batteries and extra memory cards in the diaper bag." Noah loves photographing birds, plants and LEGOs, says Silverman, who encourages his sons by including them in every aspect of the process, from photographing to editing to making photo albums on the computer. Still, he tries to keep things simple. "I lay off technique and really just focus on exploration and how they can make each photo their own," he says. "Kids dictate their own interests. If they ask questions about light or composition, then we'll talk about it. But if they don't want me to say a word, then, boy, do I try to keep quiet." Parents can encourage budding photographers by framing their children's photography and displaying it around the house. 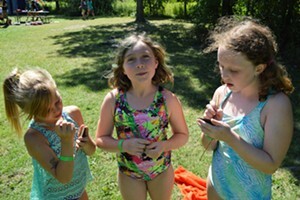 Or they can make albums, create calendars and share photos online with sites such as Flickr, Shutterfly and Snapfish. "The value a parent places on a photo is key," says Saffran. "If you value it enough to put in on the refrigerator or make a calendar, kids will feel encouraged. And if they like what they're doing, they'll keep learning."